That moment when you fall in love........ Yeah, that. 'Big Dial Bracelet Rose Gold' watch. It's a gorgeous statement bracelet style which has an oversized dial as the name suggests. Olivia Burton watches were born after founders and former London College of Fashion students, Lesa Bennett and Jemma Fennings struggled to find a stylish watch on the market that suited their fashion needs. Their creations are inspired by vintage looks and catwalk styles for the everyday chic woman. 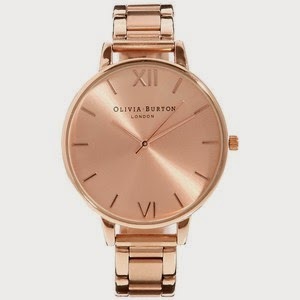 When looking through the Olivia Burton website through all the wonderfully magnificent watches, I really did find it difficult to decide on a watch that I wanted, purely because there were a few that caught my eye that I really wanted to purchase. However, the Rose Gold Bracelet style watch just seemed more glam? I felt it would suit my style more and my personality, so it just seemed perfect. At the time of writing, I have yet to actually buy the watch (I'm waiting until ASOS get them back in stock). Clearly I have chosen to purchase a VERY popular watch! Have you bought an Olivia Burton watch? Let me know what you think of them!